« The Wit of Cricket at Home and Abroad. 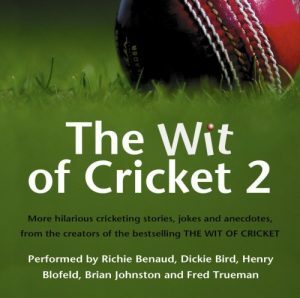 Cricket is often said to be a funny game and now you can hear why with another brilliant collection of humorous stories, jokes and anecdotes from the world of cricket as told by five of the game’s all-time great personalities – Richie Benaud, Dickie Bird, Henry Blofeld, Brian Johnston and Fred Trueman. Recorded live in theatres and in the studio here are dozens of hilarious anecdotes about England players such as Denis Compton, Len Hutton, Mike Brearley and Ian Botham – not to mention broadcasting gaffes, sledging, short-sighted umpires and the first male streaker at Lord’s!